Worlds biggest weed dealer ever. Canada’s Aurora Cannabis is king of the crop after making the worlds biggest weed deal ever after purchasing CanniMed. In what was originally an all stock bid, turned into high drama with CanniMed accusing Aurora of a hostile takeover. 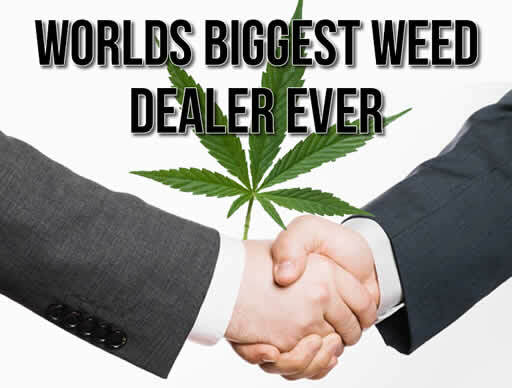 This deal, worth $CAD1.1 billion ($US852 million), makes Aurora the world’s largest cannabis company in the world. Aurora has knocked Canopy Growth of the top spot down to number 2 in the world. Aurora is worth $CAD7.8 billion compared to the value of Canopy Growth of $CAD6.9 billion. But, Canopy growth still holds top spot for its cannabis production capacity. On January 12, CanniMed announced it filed a lawsuit against Aurora worth $CAD725 million. The lawsuit alleged many wrongdoings by Aurora in its hostile bid to take CanniMed over. The company also sought personal damages from one former and one current board member. They alleging they took part in the purported plot. Aurora’s chief corporate officer, Cam Battley, said CanniMed was suing its own shareholders and that things at CanniMed were a mess. He said the company going public had exposed them to the realities of trading on the open stock market. As the United States continues to face challenged because state and federal governments cannot agree, Canada’s cannabis industry surges ahead. Aurora’s deal with CanniMed makes it the largest weed deal in history. How Aurora became aware the CanniMed Board were meeting with Newstrike Resources on November 13, 2017. How Aurora obtained any other information, whether directly or indirectly, from anyone in a privileged relationship with CanniMed. Whether Aurora had any other information that could affect the decision of CanniMed shareholders to make a decision to accept Aurora’s offer or not. The amended press release is long and complex. Read it for yourself, it makes for interesting reading. After CanniMed rejected Aurora’s all stock offer, both parties agreed to a new deal of stock and cash. With the announcement of the sale, CanniMed shares rose up to 23% to $CAD43.80 at times. The share price is currently $CAD26.45 at the time of writing. Aurora CEO, Tony Booth said they were happy to have come to agreement with CanniMed. This deal will establish a world class cannabis company with operations across the world as well as in Canada. Aurora’s purchase of CanniMed allows them to expand their cultivation facilities to meet the demand of the coming recreational market when cannabis becomes legal this summer. This would make them the worlds biggest weed dealer ever. Here are some of the 2018 world’s strongest strains.